Solid hardwood flooring is the more traditional type of wooden flooring compared to engineered hardwood flooring. Engineered floor is not a new phenomenon and has been around for several decades. 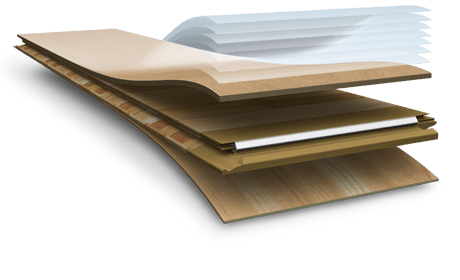 Here, we shall take a comprehensive look at whether solid hardwood floor is better or engineered hardwood flooring by analyzing the pros and cons of each. Solid hardwood is used from a single piece of wood which is then split into various slabs (longitudinal) to fit into each other at the tongues and grooves. Engineered hardwood has a specific manufacturing practice where several wood pieces are formed into layers, each one known as ‘ply’, and these plies are placed in a cross grain pattern and bonded together using heat and pressure. Now, let us look at the pros and cons of each. The biggest disadvantage of solid hardwood is the fact that they react to moisture. If the relative humidity in the room is a bit on the higher side then this type of flooring can expand. When the relative humidity drops they contract. This is regarded as instability in terms of languages used for flooring. As a result of this phenomenon, solid flooring cannot be used in basements, toilets or at any place where there is a susceptibility of moisture accumulation. Normal dehumidifiers can easily act as a prevention mechanism to such instability but the problem is inherent to this type of flooring. Engineered flooring does not have any such problems as they do not react to moisture. They can be installed in the basements, toilets or even on concrete floors. However, it has to be ensured that there is no moisture on the surface or in the room while installing such type of flooring. Solid hardwood flooring can last for several generations. As a matter of fact, more than 50 years can be an easy task for solid hardwood flooring. Sanding, refinishing or re-coating the surface once every 20 years can be good enough to maintain solid hardwood. With time, it shows the true elegance and natural grains of the wood hence enhancing the beauty and aesthetics of the property. Not only that, but they are equally easy to maintain too, much like Karndean flooring. They are resistant to scratches or quick wear and tear, however they do not possess the quality of getting their appearance enhanced as the wood has been made into plies rather than being used as a block. It is eco-friendly since the manufacturing process uses up a lot of waste which is an advantage that solid hardwood flooring doesn’t offer. It’s every parent’s worst nightmare. Their child has decided to paint the carpet. While their artwork is quite lovely, there is now a huge stain on perfectly good carpet that even a steam cleaner can’t remove. From sodas to paint, kids are messy and carpets can take a beating through those childhood years, but parents need not worry. There is a great solution for your messy spills and stain. No, it’s not selling the children to the circus, but hardwood flooring. Wood flooring can be a savior for any parent during those tender childhood years. Kids like to play, and often don’t think about their environment, which can lead to messes that Mom and Dad have to clean up. But with hardwood flooring, parents don’t have to worry about those stains and spills anymore. Most types of wood flooring can take quite a beating, even from the overly energetic play of a child. 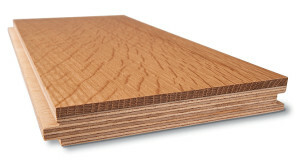 While laminates are more affordable, they often don’t have the durability and strength that hardwoods have. If you are considering removing the carpet in your child’s bedroom, or throughout your entire house, choose a hardwood that has a higher durability and denser core to it, so you can be assured that the pounding and scuffs of childhood will do minimal damage. Your local flooring company can help you choose a wood which is right for your situation. Dents, scrapes, and scuffs will be an easy fix with wood floors. Believe it or not, hardwoods are good for that too. While carpet can be replaced, how many times do you truly want to replace your carpet so that it always looks clean? For most, the thought of replacing carpet again and again is daunting, but with hardwood flooring, it’s a matter of minor clean up. Even sharpie can be removed from wood flooring! Just be sure to keep an appropriate cleaner and those nifty eraser cleaning pads on hand, and you can remove your child’s artwork in a snap. Spills are a breeze too. Carpet will absorb the moisture, all the way down to the cushion, which means that even after you’ve cleaned the carpet, the stain remains beneath. With hardwoods, you simply wipe up the drink with a towel and you’re done. No worrying about mold growing beneath the carpet, which can lead to respiratory infections or dank odors. Hardwood flooring is also good during those potty training years. Accidents can easily be wiped up and the ammonia odors will not linger. A weekly sweeping and glossing with approved flooring shine can keep the planks looking brand new. No matter the age of your child, wood flooring is a parent’s best friend. From spills to scribbles, hardwood flooring can help you keep your house in clean shape, despite the masterpieces your child creates during play. Resources Links. With Thanks To The Following For The Information On This Page.